It was simply not meant to be. Andy Carroll picked the worst time imaginable to step out of his fat suit and “pony-tail” home the winner against doomed Everton. 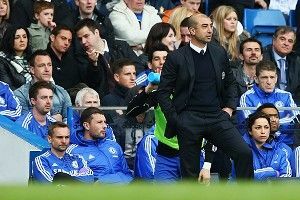 Instead of an All-Men in Blazers dream FA Cup Final featuring Chelsea and America’s team, Liverpool will play Roberto Di Matteo’s side on Cinco De Mayo. On the bright side, John Terry and Luis Suarez will finally have found a soulmate eager to shake the others hand before kickoff. In this week’s midnight pod special, Roger and Michael bemoan the FA Cup Final that could have been and breakdown why things went so terribly wrong for Rog’s beloved Toffees. Plus, the Men in Blazers recap the return of golf’s Carlos Tevez, explore mighty Ray Hudson’s bizarre sexual predilections, celebrate the state bird of Massachusetts and answer a GFOP’s hard-hitting telegram regarding the Premier League’s sexiest manager. ‘Arry can rest easy.